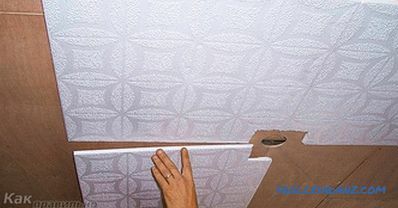 When carrying out repairs in their apartments, many may wonder if they will be able to glue the ceiling tile? 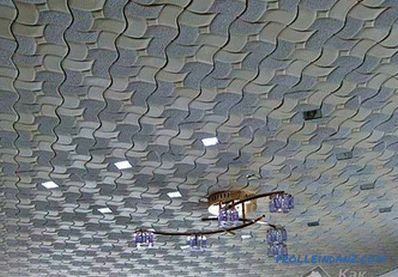 This way the ceiling design is quite common. 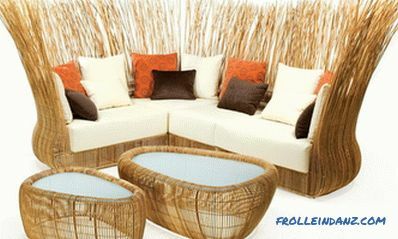 This is facilitated by its simplicity and low cost. Such material is easy to install, so everyone can cope with the task of its labeling. 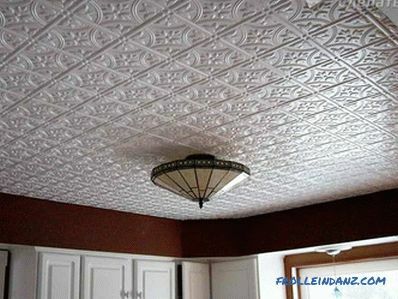 Of course, for this you should get acquainted with some of the nuances of how to perform such a ceiling trim. We will tell about them in the article. 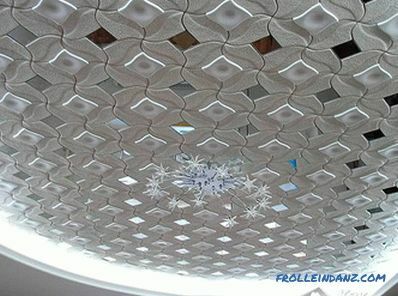 The ceiling tile itself is a square from expanded polystyrene. This material is a modification of the foam. Styrofoam is a little heavier and denser than the latter. Therefore, it has acceptable strength. 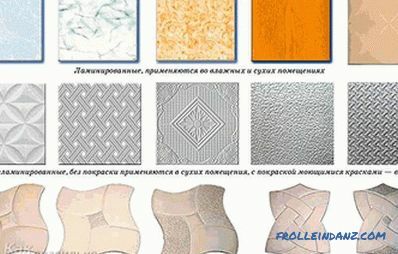 In principle, tiles made using different technologies are not much different. from each other. The most noticeable difference is the thickness. The thinnest is an extruded version, only 3 mm. 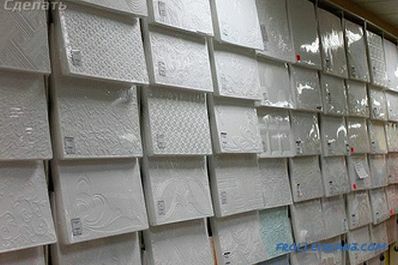 Slightly thicker pressed, and injection has a thickness of 9-14 mm. Also different is the price. But here the sequence is slightly different. The most expensive option is an injection tile, and the cheapest is pressed. 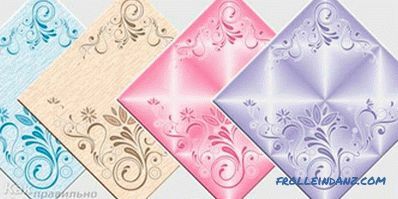 This finishing material is available in a large color range. In stores you can find a white version for painting, multi-colored and laminated. The latter may have a texture of various materials (for example, wood or plastic). 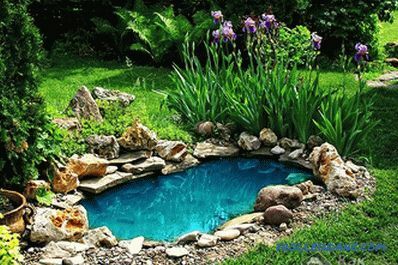 In order for the tile to adhere evenly and securely, it is necessary to choose it correctly. If color and texture is a matter of taste, then it’s worth talking about quality separately. Here, the main thing to take into account two important factors is the correct geometric shapes and strength. The first parameter can be determined by eye or with a ruler. To determine the strength of the tile, take it by one corner and shake it. After the procedure, it should remain in the hands (the corner should not break off). The clarity and correctness of the design and relief on the front should be top notch. 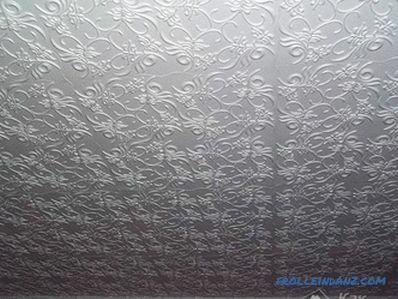 If chipped or curved lines are visible, then it is better to refuse to buy such a ceiling tile. Next step There will be a choice and purchase of glue. Modern manufacturers produce many universal adhesive masses that are able to securely fasten almost any material. Therefore, the choice of glue problems should arise. 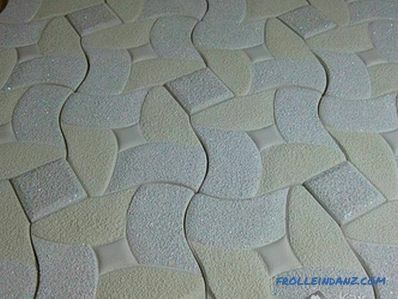 The only thing you should pay attention to is the recommendations of the manufacturers of the tile itself. Perhaps, although this is rare, they advise the use of adhesive mass on any one basis. Many repair specialists recommend applying rubber-based glue. Such material is spent more economically. But the glue with rubber components has one feature. 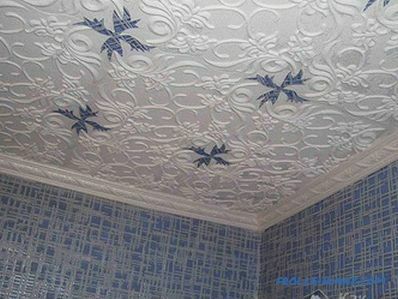 After application, you must wait a while, only then apply the tile to the ceiling. As a result, repair time will be needed more. 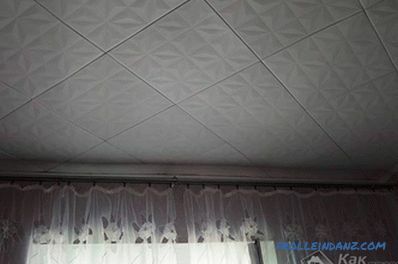 After selecting and purchasing material, You can start such work as sticking tiles on the ceiling. 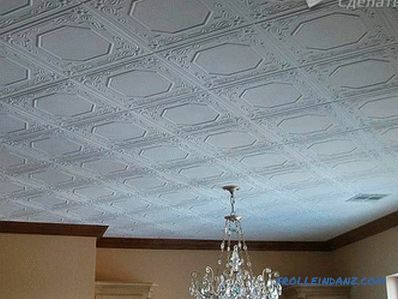 But before that it is necessary to prepare the ceiling, aligning it. 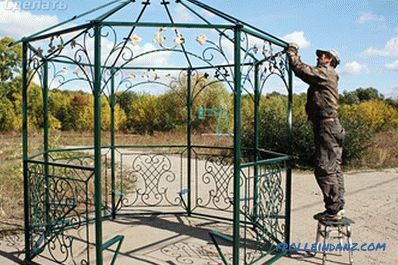 Of course, it is not necessary to do this carefully, such a decoration itself may hide some irregularities. But if the swings are too big, you will have to use plaster. Also, the surface is preferably treated with a primer with deep penetration. 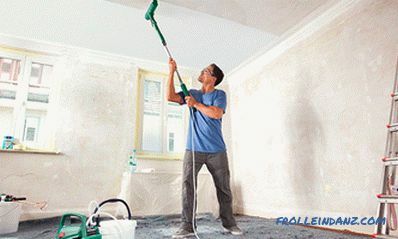 With this procedure, you will increase the adhesive properties and strengthen the ceiling. If it is intended to glue the tiles onto the whitewash, then its layer should be checked. To do this, take a spatula and scrape the surface in several places. If the whitewash layer is peeling off, then it should be removed. The fact is that the finish will only stay on this layer. If the whitewash keeps tight, then it is wiped with a rag (this way you will get rid of badly fixed sections) and ground it. In this case, the use of primer is mandatory and preferably in two layers. 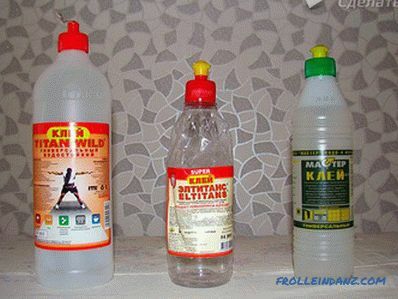 Only after the surface is completely dry can you begin to glue. If this is your first time doing this, it is better to pre-mark the surface. To do this, draw lines on the diagonal of the room. As a result, you will find the center of the room, and it is worth starting pasting from it. 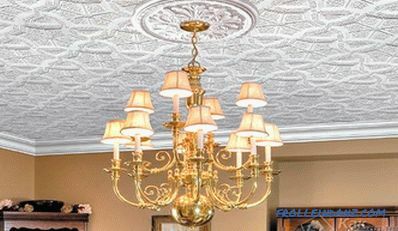 When a chandelier weighs in the center of the room, you can not do the markup. All work should start from the place of installation of the lamp. Each master decides how to glue tiles correctly. Some start from the center of the room, others from the wall.But still, if you are doing this for the first time, it is better to start from the center - so all the shortcomings will go to the corners and to the wall. The laying itself can be carried out in rows or squares, depending on how you conveniently. Glue is applied on the back side of the tile. It is better to do strips along each edge. In addition, you can put points on the diagonal or islands over the entire surface. Then the tile is laid in its place and pressed against the surface of the ceiling. It is not necessary to keep long, just a couple of seconds. Then release the pressure, wait 10–15 seconds and press it again. Often this is enough for the square to be fixed in its place (of course, if the glue is chosen correctly). When laying, make sure that the tile is laid flush with the previous one. All sides and corners should lie on the same line. If this is not achieved, then the appearance will suffer greatly. The curvature of the lines and the inevitable gaps will look very ugly. Correct bumps need to immediately. If you skip them and go further, you will have to tear off the unevenly packed segment later. And this may cause a gap, and additional costs for the purchase of new tiles. Whatever the geometry of the room, you still need to cut the tile against the wall. This is done with a regular knife. The main thing is that it should be well ground. 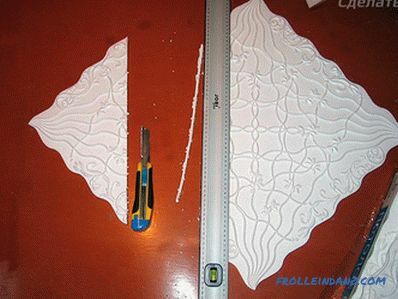 Measure out the desired dimensions and on an even surface cut off the extra piece. Do not be afraid if the edges are not very smooth. All defects will be hidden ceiling plinth.